Let me first come clean here… there is a traffic analytic platform I use a hundred times more than Google Analytics and that’ is Get Clicky. Get Clicky is where I come back to multiple times a day to see how things are going, from a traffic standpoint, for my blog. But I do look at my Google Analytics everyday and I’ve noticed a trend unfolding. I’ve been checking my Google Analytics everyday for well over a year now, and the trend I noticed is probably something I’ve always been doing, but it didn’t really hit me until about 2 months ago. The stat I always turn to first when I open my Google Analytics IS NOT the ones you’d think like Unique Visitors, Total Visitors, Traffic Sources, or Keywords. These are important, and I do get those eventually, but there is one predominant statistic that I find myself rushing to each and every day. And that is how many pages were viewed. Don’t confuse this with pageviews because one page could have been viewed hundreds of times. I want to know how many individual pages within my site – that is, how many unique pages throughout my entire site – were viewed. I remember noticing this statistic about 6 months after I started this blog and I remember thinking, “hmmm… if I could somehow increase the total number of individual pages within my site, then I would in essence be building traffic from visitors that are going deeper into my site. And this is something I’ve always equated to good quality and value to my readers. The more individual pages that are viewed within my site tells me the better job I’m doing to providing content alternatives to my visitors. Sure, someone may have hit my site searching on Google with the phrase “fushigi ball how it works”, but when they are done reading that article, they are presented with more options and more related content to dive into. And each and every article does the same thing. The only challenge to me is writing good, quality content that builds a reputation to the readers and makes them actually want to explore more articles. Anyway… the point here is that my total individual pages viewed each day has been increasing consistently ever since that very first day I noticed that statistic. Open Google Analytics > click “Content” on the left hand side > click “View Full Report” at the bottom of your content list > you’ll now see in big bold numbers and letters how many pages were viewed. 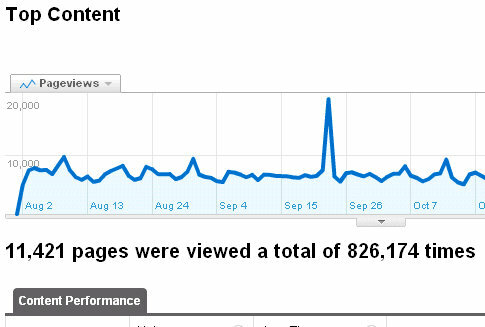 Now adjust your time frame to yesterday, see how many pages were viewed in your site yesterday. Then check it again tomorrow to see if your number is growing. You can even start going back in time and checking how you’ve doing day by day. And I want to encourage you, especially those of you who are blogging – and especially those of you who are blogging for money – start tracking, analyzing, and strategizing (if that’s even a word) ways to increase your daily total unique pages viewed.